I’ve been so impressed with the school even before I became a Director. I’ve always found the students to be amazingly humble and thankful for their situation. Their love for the school helped me love the school. John Bellis, Jr. says he has been quietly giving to Church Farm School most of his adult life. “My father once said to me, if you ever want to do something good for people, help out Church Farm School.” Bellis took that advice seriously, and would donate whatever he could each year, even when his annual income was meager. His fortune amassed considerably due to what he calls “good luck,” when Schramm, Inc., where he served as Chief Financial Officer for 30 years, was sold in 2012 to a private equity firm. “Our revenue increased from $35 million to $140 million in seven years,” he recalls. As a result, he has not only expanded his financial generosity to the school, but his engagement, too. Bellis joined its Board of Directors in May 2016. “I’m very happy to be associated with the school. It makes me feel good,” he says. Bellis’ own grandfather was an Episcopal priest in Philadelphia during the era when current Head of School Ned Sherrill’s grandfather, Henry Knox Sherrill, was the Presiding Bishop of the Episcopal Church. Bellis had the opportunity to meet Ned about five or six years ago, and his interest in the school grew exponentially. It started with a student tour of Schramm, located in West Chester, as part of the school’s STEM initiatives. 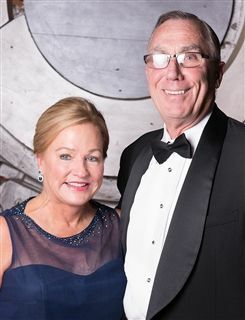 Bellis says Schramm started out as a small company manufacturing air compressors, and it eventually expanded into innovative oil and gas drilling machinery. Prior to Schramm, Bellis served in the Air Force and for 13 years as a Senior Vice President at Girard Bank, which was eventually acquired by Mellon Bank in 1983. In addition to Church Farm School, Bellis serves as a director of the Heifetz International Music Institute, a program of “the most wonderful musicians in the world” at Mary Baldwin College in Virginia.